The look for the first album, Alisha Rules The World, featured heavily on makeup, especially eye makeup, lots of it! J17 Magazine's tips on how to copy Karen and Shellie's ARTW period eyeshadow! 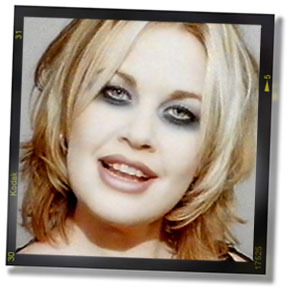 For Shellie's look, J17 rates Rimmel Eye Spy 'Jungle Orange' £1.79 and Spectacular 'Royal Flush' £1.20..
Picture right: another ARTW era eye-shadow overdose! Karen and Shellie took care of their own make-up when touring and performing on stage. Karen said: "when we're going out on stage, we're doing it ourselves, it literally is - we've got a bowl of glitter and a bowl of like, black(!) and we stick the black on with our fingers then put the fingers in the glitter and stick that over the top, and it literally is just like that, so our tour is totally bodged up affair, but when you we're on TV we get it done professionally you see." The picture on the right shows the "professional" results (the shot is taken from the "Alisha Rules The World" video). It has to be said though that they always looked good live. Shellie was once asked "what would you say to people who poke fun at your make-up style?" Her reply: "I'd say, 'It's my face and I can put what I like on it, thank you.' We're flamboyant and we love to look mad. If people don't like it they shouldn't look." The band's multicoloured image had to go, however. "We felt smothered by all that make-up," said Shellie, "and I dyed my hair so much it frazzled and fell out." But the Alisha's Attic-inspired trend for bindis and body glitter remained. "We did create a bit of fashion trauma, didn't we?" laughed Karen. "But we ran away before anyone could catch us." With the eye glitter and dramatic make-up vanishing on the "Illumina" promotional outings, the girls had a more natural, less theatrical look. Was this a personal decision or influenced by Mercury Records? "Oh God no! They don't tell us how to look, thank God!" So why a drastic image change? "It just got to the stage where we couldn't be bothered with all the make-up. It's always nice to have a change - as this album's more open, more acoustic on the image front, we thought why not?"